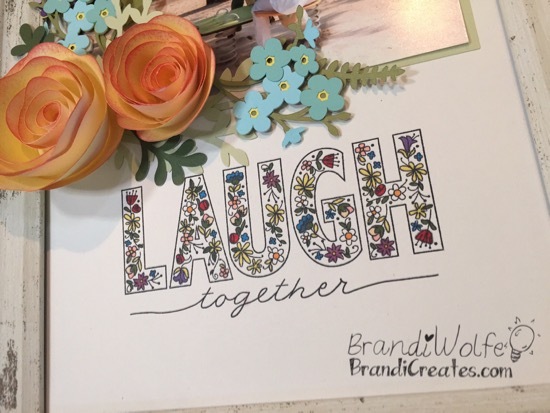 I have had SO MUCH FUN with the May Stamp of the Month, Live, Laugh, Love! And now that Mothers Day has come and gone, I can share with you the special gift I made for my Momma for Mother’s Day. This is our all time favorite picture together, playing on the teeter totter in Paris, outside of the Notre Dame. So when I saw this months SOTM, I knew right away that I wanted to create something special for my mom with it. I picked the frame up at my local Home Goods, and decided to ditch the glass and create a 3D piece. Using both the Close to My Heart Flower Market Cricut Cartridge and the Artbooking Cartridge, I cute these super fun flowers! The roses were cut from White Daisy Cardstock, and then inked with Lemon, Tangerine, and Pomegranate Exclusive Inks. I absolutely LOVE how the roses turned out! And it was SO quick and easy! For the “LAUGH”, I used a variety of our Shin Han alcohol markers. Even though the stamp is intricate and delicate, it was pretty quick to color! With just a touch of the marker, the ink filled the flowers. The toughest part was deciding which colors to use! As always, you can get this D-size Stamp of the Month set for just $5 with a qualifying $50 purchase! That means you can take advantage of the National Scrapbooking Month, Live Beautifully Bundle for $68.95 and get this awesome stamp set for just $5! Better hurry before it’s too late! Previous Happy National Scrapbooking Month! Next Cutting Guide Sale… YES PLEASE!